The outerwear of Banana Republic is designed in simple and clean style. This is true especially for jackets and coats. A typical Banana Republic jacket is made with a wool and nylon blend, which make it strong and durable. The jacket maintains its timeless appeal. Let's talk about the black pea coat I got at a Banana Republic store. The cut of the black pea coat is trendy. The structure in the shoulder area is firm, which makes one look classy. To maintain its firmness the pea coat is not as light as you wish, but it does give you the fashion look you want. 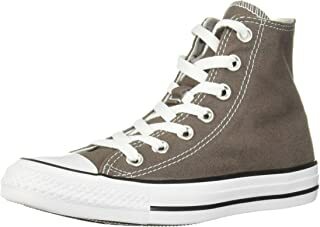 You can wear to work or to a nice restaurant. Photo #1 shows a black Banana Republic pea coat worn over a Banana Republic gray turtleneck sweater. The black pea coat and the gray turtleneck sweater are an unparalleled match. They look EXTREMELY fashionable together! 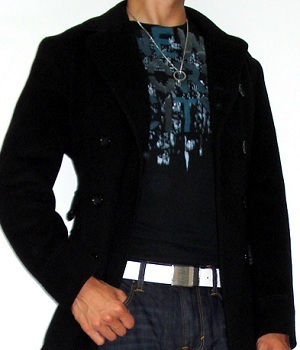 Photo #2 shows the black Banana Republic pea coat over a black graphic t-shirt, paired with dark blue jeans. 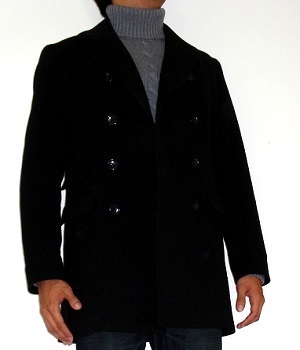 Note that this black pea coat goes best with DARK blue jeans, not light blue jeans! The price is not low for a pea coat but the jacket provides one a classy look which makes it all worthwhile. The coat should only be dry cleaned. After all, you don't want such expensive garment to be ruined by a washing machine. How Else Should I Wear this Banana Republic Black Pea Coat? As we mentioned earlier the black pea coat goes well with a gray turtleneck and a graphic t-shirt. 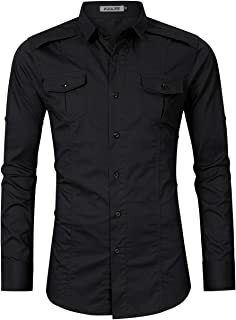 In fact if you wear this black pea coat and a dark blue jeans, you can wear a sweater or t-shirt of any of the cool colors and neutral colors. For example black pea coat pairing purple blue striped sweater is a great outfit. Black pea coat pairing dark blue sweater is also a wonderful match! I wouldn't recommend accessories because the buttons and collar make the coat look trendy enough. You do not want to overshadow the unique style of the coat with accessories. Accessories are for simple, plain clothes, and they are not for sophisticated clothes such as a pea coat!